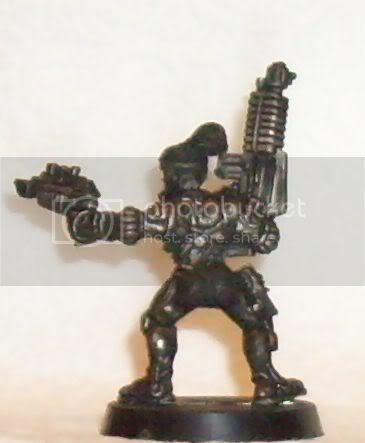 I have a large Escher gang and want to start adding hired guns. But to keep with the gang I want to use only GW female minis. Any thoughts, suggestions or ideas? Come take a look and join our forum. Who/what is this Bonnie Annerson? I closed your other thread because you have essentially repeated and elaborated on the topic of female hired guns here, you really don't need two threads for that, so I urge to request her rules here, whoever she is. The only other female ganger I've heard of, doubt there was a model or even rules, is one of the characters from the Kal Jericho comics. As to making female versions, well I reckon you can make a decent pit slave and perhaps a few others from some converted Escher models. I suggest you check the internet for other modelling companies to see if you can't find a few models in the right scale that fit what you're after. Wasn't she the anti-vampire special character from one of the gang wars? The one based on buffy summers? She was a Bounty Hunter whose family was killed by Spyrers. And now wants revenge. There's a Bloodbowl star player that is 100% Buffy. My issue is in wondering why you're just sticking to GW models. The 40k range leaves a lot to be desired on converting to Necromunda. There'll be more in that range that will be of use, I suggest you have a look through. There's an awful lot of good models out there that would work for what you want, limiting yourself to GW stuff is going to give you a lot more work. In addition to that, however, if you can actually get ahold of it, because no doubt GW have stopped supplying it, I do believe they made a female Bounty Hunter, which has since disappeared off their site, surprise, surprise. Just a note, but in one of the Gang Wars, there was rules for a 'Lhora Croft' the Archeotech Raider, and Freeboota happens to provide an ideal model for her. You could same im abit of a GW fan-boi. Just love the stlye and want to support my chosen games and minis. Not bothered about having to do alot of work on them. I'm so used to hearing that it's not funny. Well I think you're missing out, but it's your choice. I say you're making a mistake, there's loads of good miniatures out there and they could all use supporting. GW is merely one provider, not the first, and in my view, not the best either. You could look into finding that Female Bounty Hunter though, it was a relatively new one, of a batch of 3, and I'm particularly surprised that I can't find it on the GW site. It seemed to disappear off the site with the change over. I have been searching ebay but no luck so far. Man! She is one ugly miniature. There was a female Ratskin that was developed but i dont think it was put out, or if it was it was in a VERY limited run. Can't remember all the details but i do recall it being mentoned somewhere. 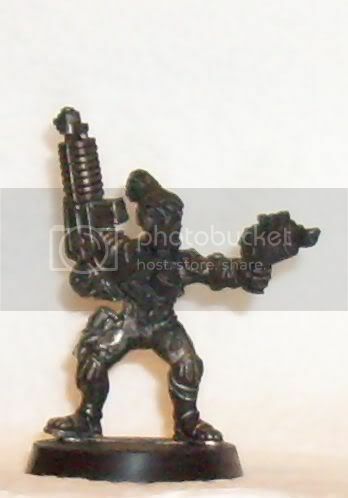 In WH40K there was a few femal imperial guard figures made- mostly in the Jungle fighter range. For a few suggestions, i would try some of the female figures from Dark Eldar or maybe some of the Howling Banshee from Eldat. Some consideration might be given to using some of the females from regaular WH - or if nothing else at least use the torsos. Worst case suggestion: get a good male figure that you like, get some green stuff and add some "female details" to the chest area and then some green stuff hair or even just a simple head swap from another figure. That is precisely what I did to make this female Van Saar.